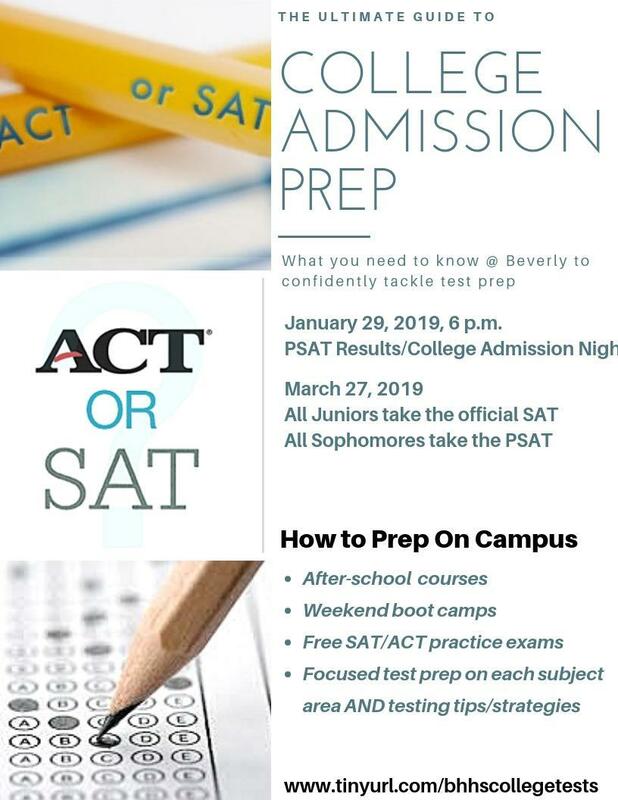 Beginning with the Class of 2020, all Juniors will be taking the official SAT in March of their Junior year, and all Sophomores will take the PSAT in March of their Sophomore year. The exam is provided school-wide by the district. Please review on-campus test preparation options below to help you feel confident with an admission testing plan and timeline. Take a look at THIS ARTICLE to learn the differences between the tests. 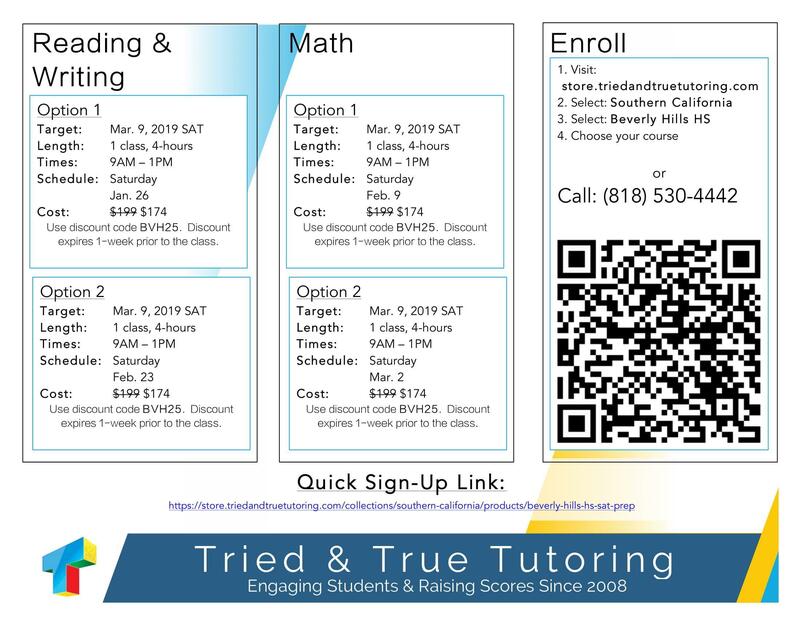 The best way to determine which test students should focus on (SAT or ACT) is to take a full-length practice SAT and a full-length practice ACT then compare the two scores as well as their experiences. BHHS offers such exams, usually in late Fall for Juniors and Spring for Sophomores and Juniors, dates can be found on the daily bulletin and emailed via Jupiter. Local test prep companies also offer full-length exams for FREE. Some colleges and universities are "test optional." This means that they either do not require standardized testing or they will accept alternate forms of measurement like a graded paper. To learn more, visit the National Center for Fair & Open Testing (FairTest) at www.fairtest.org. For a comprehensive guide to college admissions testing, please click HERE and download, for free, The Compass Guide to College Admission Testing. What is the SAT & SAT Subject Tests? ACT: What is the ACT? 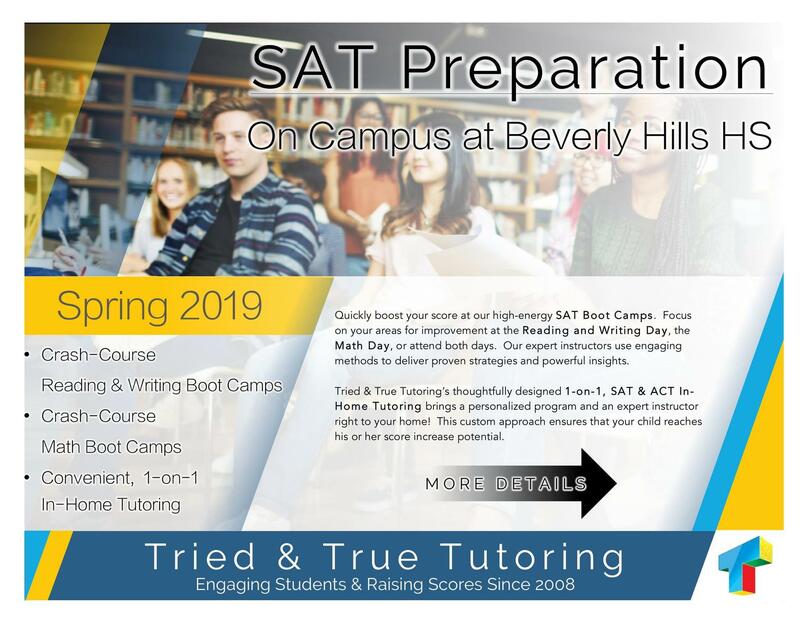 Beverly Hills High School offers SAT and ACT prep workshops and courses on campus throughout the school year. We do not endorse one company over the other. If you are interested in receiving test preparation from any of the companies listed below, we strongly suggest that you ask for references. During 2018-2019, BHHS will offer programming for SAT and ACT preparation. Please note test-prep programming may be subject to change/added. For more information and to register we will send information out via the Daily Bulletin and emails via Jupiter. Email crowley@bhusd.org with any questions. We recommend families sign up and reserve spaces early to ensure registration. Free to all students, maximum 80 spaces first-come first-serve. Secure your space by going on Naviance and clicking on the “colleges” tab, “research colleges” and “college visits.” http://tinyurl.com/bhhsnaviance Provided by Sylvan Learning. Sign up for all 3 Sylvan courses to get the most out of the class! Free practice exams in the student's choice of ACT or SAT are offered on this date. The test results are invaluable in helping to craft the ideal testing and tutoring plan for students. Free to all students, maximum 80 spaces first-come first-serve. Secure your space by going on Naviance and clicking on the “colleges” tab, “research colleges” and “college visits.” http://tinyurl.com/bhhsnaviance Provided by Sylvan Learning. Sign up for all 3 Sylvan courses to get the most out of the class! Students will practice strategies and if they have taken a practice exam, are encouraged to bring their results to work off of.